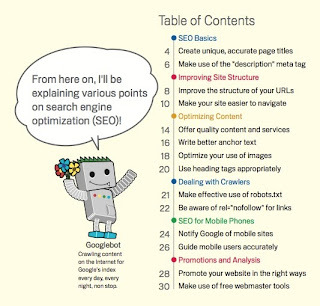 I am constantly asked how to optimise a web site for search engines and specifically for Google. This really is not rocket science but many find it difficult, so here are some tips. One of the first things it mentions is getting your meta tagging right and how important the 'description' tag is. What you put in this tag will appear on search result pages, so you should word this carefully. When used well it will draw people to your site. meta name="description" content="Jeff is an engineer, entrepreneur and researcher specialising in information and communications technology (ICT)"
Lastly keep the structure of your website simple and logical (this is covered in the Google doc on optimisation) and use accessible and logical page titles and URLs. My 'projects' page is; http://www.jeffsportal.co.uk/projects.html (title 'Projects') - a simple approach but all too often ignored. 1. Ensure your 'description' meta tag is something you want to appear in a search result and something that will draw people in. 2. Add your site to the Google index, via their tool. 3. Use page titles and URLs that are simple and obvious - help the user.